For more than five decades, GOYA has been making life sweeter for every Filipino, by making chocolate products that fits every peoples lives. From chocolate bars, chocolate covered-pretzels, chocolate wafer and even chocolate spreads. Recently an event called "Celebrate Everyday with Goya" was prepared and attended by Goya supporters, media and friends who patronized them through years. 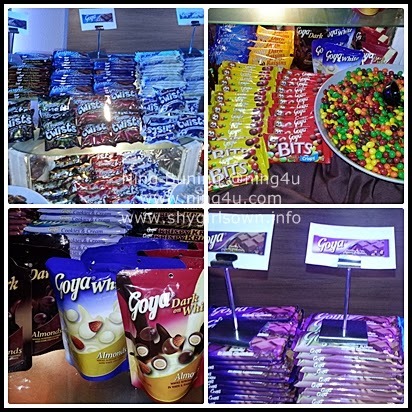 The night was full of fun-filled chocolate-ish ambiance, as people enjoyed the taste of Goya products that is waiting for them at the Chocolate Buffet. The momentous event even more memorable, because Goya introduces their brand endorser, non other than The Primetime Princess Kim Chiu, who offered a song and generously gave her time to each and every one in the room. From photo opps to games, Kim offers her sweetest moment with us and celebrate the moment. "With Goya, we now make delicious, world-class and premium-quality chocolates that are within their reach. They don't have to spent more or wait for their padala to enjoy delectable chocolates. It's now available right here in our country, the finest chocolate at a price they all can afford. That alone is worthy enough to celebrate" explains General Manager Josenilo Chincuanco. How was that to celebrate your everyday with Goya? Isn't it the sweetest kind of offer only from our country's very own products. So let us all celebrate life and celebrate it with Goya. For more details you may visit Goya Chocoholics on Facebook fan page http://www.facebook.com/GoyaChocoholics .